It's a rainy evening and the 1st graders in your children's choir are extra wiggly. You need a quick change-of-pace to keep their attention and get through rehearsal. Been there? I think we all have. There are lots of games you could play, but I like choosing games and activities that keep the focus on music (and maybe get the children up and moving for a few minutes). 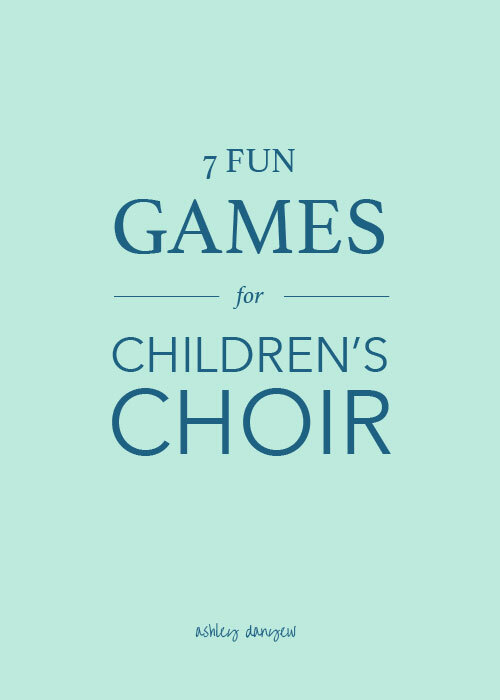 Today, I'm sharing a few of my favorite (musical) games and activities for children's choir. This activity works well with songs in duple meter and with 4-bar phrases. Set a red solo cup upside down in front of each child. Beats 1-4: Clap two times. Hit the bottom of the cup three times (right-left-right). Beats 5-8: Clap once. Pick up the cup and set it down. Beats 9-12: Clap once. Pick up the cup with your left hand. Hit the top of the cup with your right hand. Hit the bottom edge of the cup onto the table or floor. Working with younger children? Here's a simplified version. A great movement activity for young singers! Have children stand in a circle, singing and tapping their legs and the hands of those on either side of them. Call out children's names or assign each child a number before you begin to give them an opportunity to do a solo movement, stepping in toward the center of the circle (4 beats) and back out (4 beats). Have all children "echo" this movement during the next eight beats. See a video of this activity here. A fun hand game (source) - works well with pairs of children (have them clap their partner's hands). Try having half the group sing a familiar song (again, duple meter with 4-bar phrases) and half the group accompanying with the boom, snap, clap sequence. See a step-by-step video here. "Diddly-dee" = pass this sound over the person on your left or right with both hands reaching over the head of the person being skipped. "Zoom" = pass this sound across the circle with a forward action of the arms and body. This activity reinforces inner hearing and solfege hand signs and it works well as a segue to repertoire at the beginning of rehearsal, especially if you use solfege and hand signs during warm-ups.